I love knowing the releases of upcoming books. I write them in my agenda and they help me get through dreary Mondays at work. I go through the author sites, check their upcoming releases, then write them into my agenda religiously every year. This time around, I thought I’d share some of the titles I’m particularly excited about with you guys. That way, if you’re a fan, you can also add them to your list. Madeline Hunter has Tall, Dark and Wicked coming out October 6th. Nora Roberts has Stars of Fortune coming out November 3rd. 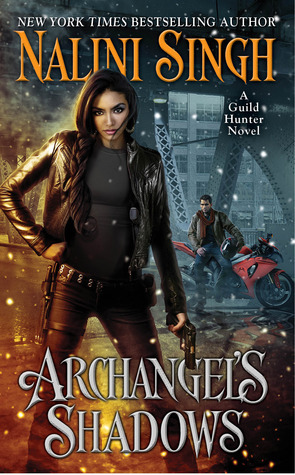 Nalini Singh has Archangel’s Enigma coming out September 1st. Elizabeth Hoyt has Sweetest Scoundrel coming out November 24th. 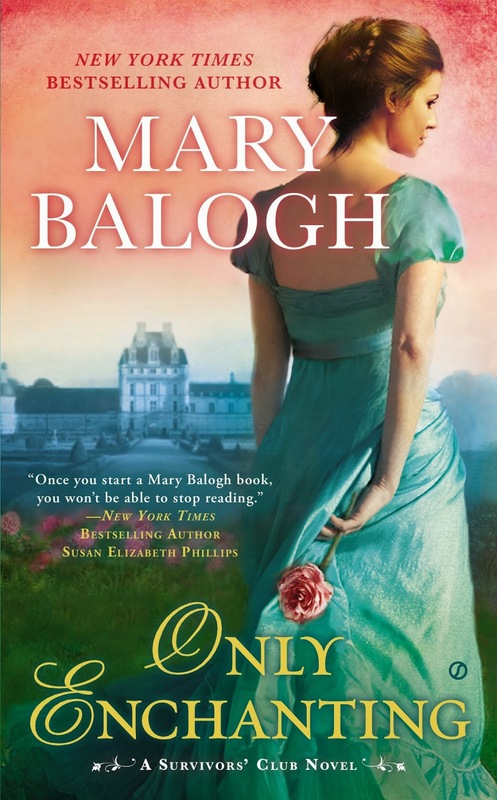 Mary Balogh has Only a Kiss coming out September 1st. Kristen Ashley has Hold On also coming out September 1st. Jill Shalvis has All I Want coming out October 6th and My Kind of Wonderful December 22nd. Annabel Joseph has Torment Me coming out at the end of September. There are some amazing posts out there. I’ve collected just a few here that stood out in my mind. If I’ve missed one, give me a shout and let me know! I love to find new awesome posts. This one comes from adpushup.com. They actually sent me their link! It’s a great article on 50 resources for bloggers. They have them by categories with links for convenience. Just awesome! A huge thanks to them for sending me that link! A huge congrats to Winter Bayne for her first fantasy story in The Dragon Tempest. Winter Bayne is one of those incredibly talented writers on the rise. This is what she said of her newest work: “It is a story of discovery and realization both for the characters and readers. And I pat myself on the back for getting what I would consider a speculative (maybe paranormal) fiction romance into an Epic/ Dark Fantasy Anthology.” Check it out here. If you’re a fan of Elizabeth Hoyt, don’t miss out this review of her latest book, Dearest Rogue by Penny Dreadful. If you haven’t heard of her, here’s a great chance to get to know one of the best writers of historical romance. Hands down. 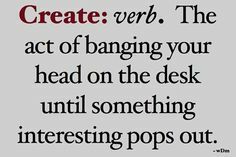 For the writers out there, here‘s a great opportunity to share your WIP. Chris, the Story Reading Ape has this great blog with awesome opportunities, links and supports for writers. Check out this one from Britney Sahin, she offers her blog to promote your book! This resource also came to me through email. It’s an amazing post with 51 Must-Visit Sites for Writers from Now Novel. Not only are there great resources, they’re classified by categories. An absolute great link to have handy. What a great post and a HUGE thanks to Now Novel for that link! If you write historical fiction, might I suggest this site? The Historical Novel Society keeps a great selection of resources, reviews, features and news. I really liked the post by Porter Anderson in Writer Unboxed titled In our CyberVillage: so much anger. Maybe because there’s a false sense of security in our anonymity online, there is a lot of anger out there. Whatever the reason, the result is hurtful and Mr. Anderson has a great, peaceful way of dealing with online bullies. I liked his suggestion and his insight. Being married to a British man, this post on Nicholas C. Rossis hit close to home. Canadians are known for apologizing needlessly, but there’s nothing like a Brit to understate something. Check out this hilarious Translation of some usual British comments and what they actually mean. Becoming Minimalist is one of those things I’m slowly trying to accomplish and the blog by that name is a huge help. This weekend, they had a post with carefully chosen articles to inspire simplicity and a selection of awesome blogs. Check it out! There are absolutely great posts out there and simply not enough time for me to share all of them. Still, I had to mention this one. Just Gene’O is a blog I never miss and this post with its incredible metaphors is one of the many reasons why. Absolutely recommended. Hands down. These are my favourite series in no particular order. In order to make this list, the series has to have more than 3 books and they have to reside on my Keeper Shelf. * The Black Dagger Brotherhood by J. R. Ward. * The Guild Hunter Series by Nalini Singh. * The Psy/Changeling Series also by Nalini Singh. * The Bedwyn series from Mary Balogh. * The Maiden Lane series from Elizabeth Hoyt. Did I miss any? Rats! * The Rarest Blooms by Madeline Hunter! Miss any now? 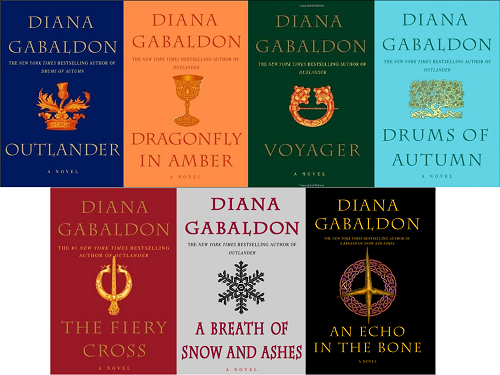 Do you have a series you adore? Or one I should have included? Give me a shout! I love to find great new books! P.S. If you click on those covers, you can go to the author sites. I love the theme Beauty and the Beast. It’s a favourite premise of mine, so I was thrilled to have Elizabeth Hoyt write it. I have read every book she’s written because I find she’s consistently awesome. Her characters are incredibly well written, fresh and new. The dialogue is quirky and fun and her books are over before I know it. She’s on my automatic-buy list. As soon as I get a new calendar, I write her release dates on it. She’s that good. This book was no disappointment. Apollo Greaves is the ‘beast’. A monster of man who can’t speak. I loved that premise and wondered how could she ever make the romance happen when he was mute. How could she create tension? How could she put in her quirky romance? I won’t tell you how, but she does do it. In spades. There’s also Lily, our heroine. A wonderful person who’s down on her luck and has to live in an abandoned theatre with her son Indio and their hilarious italian greyhound Daff. Lily was so easy to like, I was her best friend within a few paragraphs. It’s no secret that I like dogs and Daff was a particular favourite of mine. She’s so funny and naughty and still realistic that I looked forward to every scene with her in it. 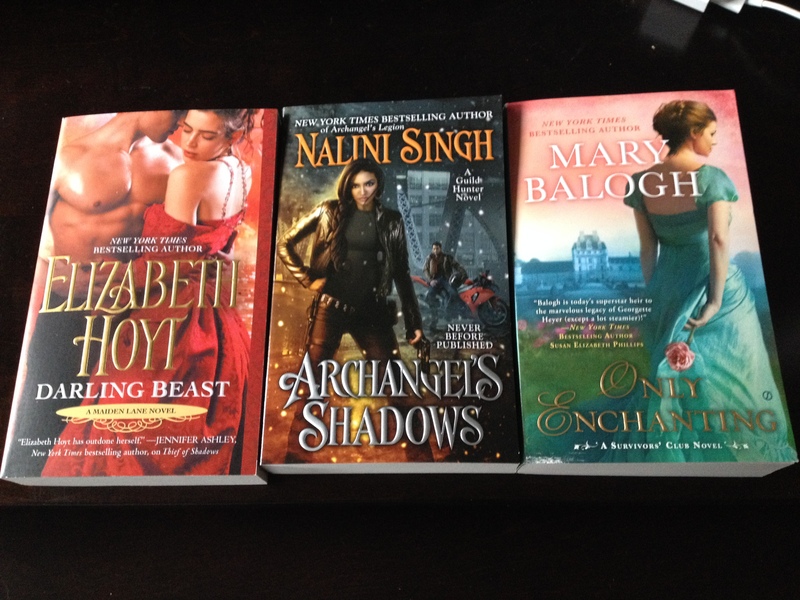 Touching and moving, Darling Beast is a great historical romance and another definite joy in my work week. I have to admit, I snuck read it and took it everywhere. Couldn’t stop reading until I turned the last page. 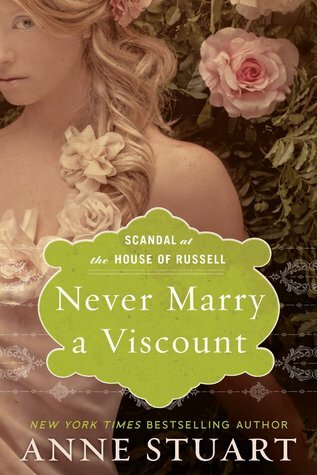 If you’re a fan of romance or historical romance, I’d highly recommend this one. “If she lived through the day she was going to have to apologize to Indio. For there was a monster in the garden.” Pg. 9 from Darling Beast by Elizabeth Hoyt. In his latest attempt to sell our house, my lovely hubby has pulled out all the stops. He hired an interior decorator (to give him ideas) and argues with himself about everything from paint colour to decorative cushions. So far, he had only been talking. Until today. I arrived home to the smell of paint and noticed there were several bushes missing outside our house. One more glance told me I was wrong, there weren’t several bushes missing, there were trees missing as well. Then I looked inside the house. This morning our house was a cream colour. Today, every room is a new rainbow shade. Furniture has magically moved or is missing altogether, we have new covers on our beds, pictures are in odd spots and every counter is bare. Not a soap, or toothbrush in sight. Our dogs, who could easily disrupt this transformation, were banished outside. It really is a beautiful day. Eagerly awaited, these books are the ones I’ve marked on my calendar and keep me going through those dreary Mondays at work. Here are a few along with other favourites! If you’re still looking for books, here’s another post with even more books from All About Romance.